Traditional jazz and swing band for hire. Dr Bone and the Rhythm Boys is a versatile 1920s style quintet featuring the novel line up of trumpet, trombone, tuba, saxophone and drums. 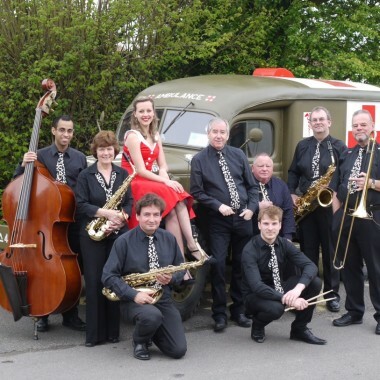 The Surgeons of Swing are a versatile and energetic band of up to ten musicians, playing a great mix of swing, jive, jazz, ballroom and Latin music from the 30′s to the present day. Chameleon Arts Management, Sandhurst, Kent. Dr Bone and the Rhythm Boys is a versatile 1920s style quintet featuring the novel line up of trumpet, trombone, tuba, saxophone and drums. 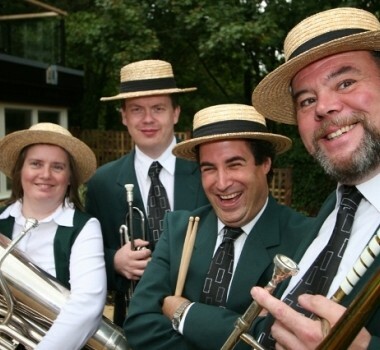 With its uniform of blazers or waistcoats and straw boaters it has tremendous visual appeal and with its large library of bespoke, tightly written and witty arrangements it is perfect for garden parties, corporate events, receptions, product launches and any occasion where high quality live music is required. Their play list contains not only well loved jazz and swing standards, but tunes from just about every decade of the 20th century, all cleverly arranged in our ‘happy go lucky’ style making it ideal for mixed age audiences. For special occasions we can, given time, arrange requested tunes for particular clients and to fit in with particular themed events. The band carries full public liability insurance. Dr Bone and the Rhythm Boys is completely acoustic, needing no electricity and even providing it’s own gazebo. However, we can provide P.A. for background/continuity music or for speeches and so on if required. • Music from the JAZZ AGE…Louis Armstrong, Bix Biderbeck, Red Nichols, Fat’s Waller, Al Jolson etc..
• Tunes from famous Broadway and West End shows, the music of Walt Disney’s films and children’s favourites from the world of film and TV. • Full Christmas library for the festive season. • Completely self contained, needing no electricity. • P.A. system available for background music etc..
• Smart appearance and professional, qualified musicians. • Music for listening and dancing to. 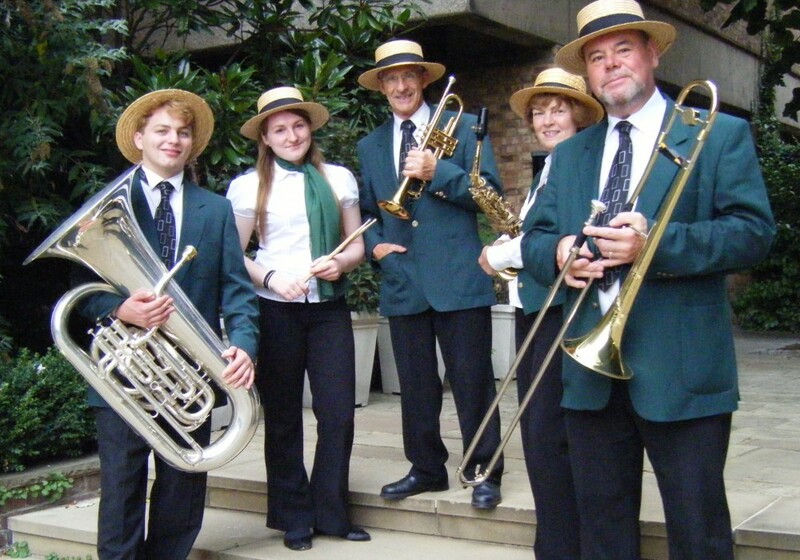 The Surgeons of Swing are a versatile and energetic band of up to ten musicians, under the leadership of trombonist Paul Hyde, playing a great mix of swing, jive, jazz, ballroom and Latin music from the 30′s to the present day. Jive and swing – Woody Herman, Peggy Lee, Nat ‘King’ Cole, Glenn Miller, Benny Goodman, Louis Jordan, etc. I just wanted to send a quick email to let you know that we were happy with the service we booked last week. Dr Bone and the Rhythm Boys were great. They played lively, happy music and created a great atmosphere at our event. Exactly what we asked for. “…….I just wanted to drop you a line to say thank you so much to you and your band for making our wedding reception brilliant! everyone loved the music and I saw relatives dancing who generally don’t even walk! ……Please pass on a massive “thank you” to all the band ….you were great!